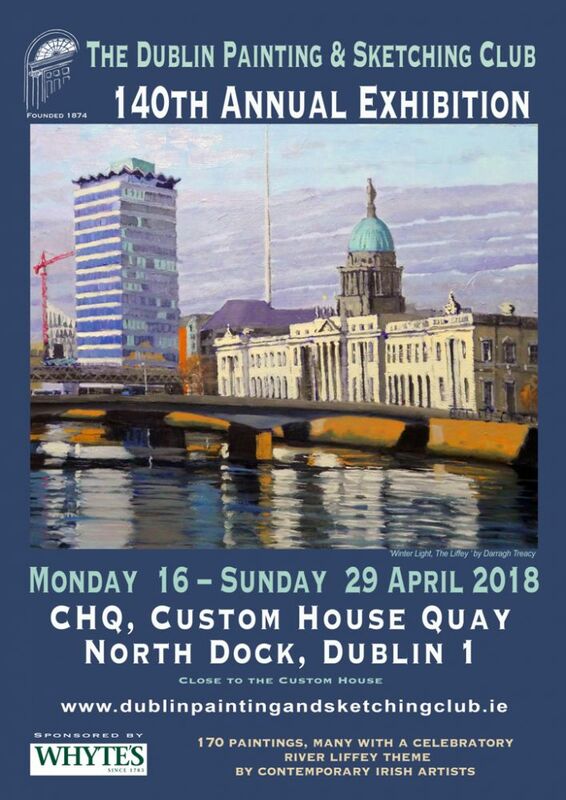 Dublin Painting and Sketching Club’s 140th annual exhibition will be held at in CHQ, in the IFSC, in Dublin city centre from April 15 to 29th 2018, exhibiting 170 paintings from the clubs 70+ members. On October 20, 1874, in Westland Row, a group of artists started the Dublin Painting and Sketching Club. Among them were Alfred Grey RHA, Alexander Williams RHA and Bram Stoker. Looking from a first-floor window they could have seen the Stack A Warehouse on the north side of the Liffey. It was the largest interior space in Dublin at that time. But, for their first exhibition in 1876, they chose more modest premises… the Clarendon Horse Repository and Riding School, at the back of Trinity College. Later, the Club exhibited frequently in No. 25 Molesworth Street, formerly the Queen’s Institute for Educated Women. During the 20th century, annual exhibitions were held in different parts of the city. For a time, they went north, to the Irish Life building in Abbey Street. But, eventually, it became impossible to find suitable locations and, from 1998 to 2017, this venerable Dublin Club went south, to exhibit in the spacious Concourse Gallery of Dun Laoghaire Rathdown County Hall. Dun Laoghaire was great but, as the 140th annual exhibition approaches, the club has decided it is time to come home. Our roots are beside the Liffey. Settled there again we can reflect on the life and energy of the city. Now-a-days, Westland Row and the North Quays are linked by the Sean O’Casey Bridge. The north end of the bridge is directly before the Stack A Warehouse. Designed by Scottish master-architect, John Rennie, the building has been lovingly restored – and renamed CHQ, (Custom House Quarter). During April, this splendid space will house the Club’s 2018 Annual Exhibition, with 170 paintings from 70+ members. Recently, the arrival of younger painters has revitalised the Club. Many of these are Art School graduates who, in defiance of Establishment values, have learned to paint. They are fine representatives of the revival of expressive painting that is changing the world of art. The ancient idea of painting as visible poetry is also returning. It will be what we look forward to seeing in years to come. 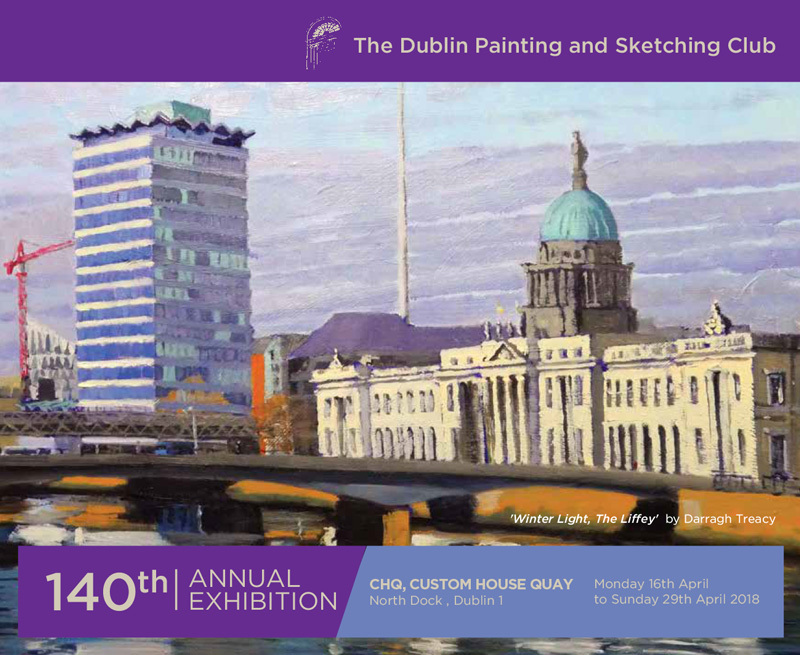 Join us for a new beginning, at the Dublin Painting and Sketching Club’s 140th Annual Exhibition, in CHQ – just past the Custom’s House – April 15 to 29, 2018.